He will tell them about his journey from being a football fanatic at school (just like so many of them) all the way through to working with the England Team and becoming a football author. It is a fun and inter-active session, for both boys and girls, using their passion for sport to engage them in reading, writing, raising their aspirations and thinking about their futures. If you want Dan to stay longer at your school, it is possible for him to come to individual classes after he has spoken to answer questions and talk to the pupils in more depth. 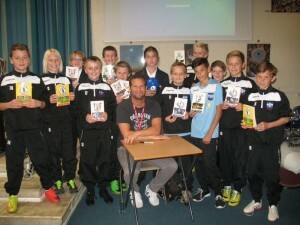 If you want Dan to come to your school for a longer period, it is possible to do a football writing workshop with a smaller group after Dan’s talk. Dan will work with a class (up to 30) to help stimulate their creative writing. Dan will read an excerpt from one of his books and stop at a cliff-hanger moment…The students are then invited to write what happens next, with Dan giving them tips, hints and encouragement as they write. The kids then read out to each other the endings that they have come up with and they discuss what they liked about one another’s work. It is a hugely enjoyable session which shows the pupils that they really do have the ability to write creatively and can have fun doing so. Teachers are often amazed at certain pupils’ ability to produce a significant amount of writing when channelled in this way. A workshop lasts between 60-90 minutes. In this session Dan will take pupils through the process of writing a press release. Why are they necessary? Who are they for? What is the specific style of writing required to compile one? Perfect as an introduction to news reporting, this fun session, in which pupils will also be shown the importance of deadlines and exclusive interviews, is ideally suited for for KS 2 and 3. Drawing upon his work with The FA, The England Team, The Premier League and FIFA, Dan will give an insight into the role of media in top -level sport. Lots of amazing behind-the-scenes stories too! Obviously, there is nothing quite like a personal visit from Dan, but as there are occasions when this might not be possible we are now able to offer video conferencing as another option. Dan can now connect with schools worldwide to deliver his Big Talk, or follow up on work carried out during an actual school visit in the UK. These virtual visits are easy to organise and can be tailored to the needs of your school, so if you would like more information please contact us to discuss. From his contacts in the game, Dan can bring with him one of the best young football coaches in the country, who is also a scout forHUGE PREMIER LEAGUE CLUB! So, having talked and written about football with Dan, the pupils can then get outside, get some exercise, improve their skills and maybe, just maybe, get spotted by a Premier League club. These high quality, innovative and fun sessions, provide an enjoyable learning experience for all abilities, both boys and girls. Not only will the pupils benefit and learn from the sessions, but teachers are also encouraged to observe in order to further their ability in producing top level sports and exercise lesson plans in the future. This session is for schools that are looking to put on a really unique and memorable day for their pupils. They are the perfect way to rounding off the ultimate school football learning experience. Dear Dan you have been to my school and you showed us a clip of the jamie johnson series, i searched it on youtube but i couldn’t find it are you going to release it? – when? and on which programme? The BBC? We would love you to visit our school. Can you please let me know when you are available. We would love you to visit our school. hi dan just what want to ask what team do you support? Tottenham … I have done all my life! Hello Freddy. Hi had a wonderful time at your school last week. It was great to see you all. I hope you enjoyed yourself as much as I did. 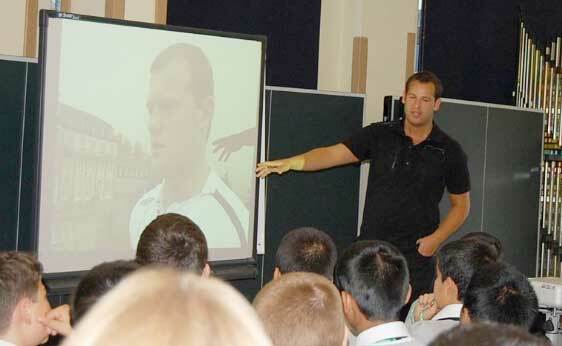 We were delighted to have Dan into our school and just have to say it was a wonderful event. We are also delighted to have recently received a letter from Dan asking us to nominate the most promising football player in Year 7 – we certainly found one! This pupil goes on to receive a copy of Born to Play from Dan and also a certificate which will be awarded in our end of term Assembly – thank you Dan. My absolute pleasure! Say hi to everyone at the school for me! You will have to ask your teachers Lee. I would love to visit your school! Hi Dan you came to our school yesterday (How Wood). I really enjoyed listening and talking to you at the book sale. I am currently reading your first Jamie Johnson book witch I bought yesterday. I am already on part 2 and I am loving this book. My mum was surprised to see me still reading at 10 o clock at night! How Wood was a great school! I really enjoyed my time there last week. I’m really pleased that you’re enjoying your book. Which one are you reading? I remember Nelson Primary very well. It was a great visit and everyone was very friendly. Leave a Reply to Dan Freedman Click here to cancel reply.